Personalized kangaroo shape bottle opener keychain is one of the most sought after business gifts, do you know why? Only because they are affordable, adorable, practical and colorful. This durable bottle opener is made from high quality aluminum, which ensures that your business messages are seen for a long time. This bottle opener keychain comes with a carabiner, which can be fastened over the belt loop or it can be retained over backpacks, etc. It makes a wonderful choice for individual gift or combo gift throughout the year. It works best for marketers targeting party crowd and youngsters. 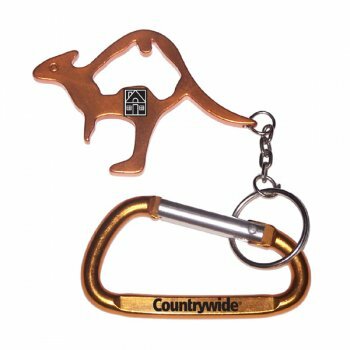 Request a quote for knowing price savings on wholesale custom kangaroo shape bottle opener keychain. Features – Kangaroo shape bottle opener with key ring in metallic finish. Available color - Metallic Blue, Metallic Green, Metallic Gold, Metallic Purple, Metallic Silver and Metallic Red. Product Size – 2 3/4" x 1 13/16"
Imprint area – 1 1/2" x 5/32", 15/16" x 3/16"
Imprint Area :15/16" x 3/16"
Product Size :2 3/4" x 1 13/16"